When I worked in newspapers, it wasn't at all uncommon to compete head-to-head with other newspapers on a big story, and to see that subject lead all of the papers on the same day. But competing magazines like to have their big, narrative stories as exclusives. So it was interesting to see GQ and Esquire both publish longform takeouts Monday describing private zoo owner Terry Thompson's release of 50 animals - most of them large carnivores - on his farm in Zanesville, Ohio last October. After setting the animals free, Thompson committed suicide with a gunshot to his head. The local sheriff and his deputies, responding to a complaint from one of Thompson's neighbors that an African lion was prowling her property, were faced with tigers, grizzly bears, mountain lions, and wolves as well. With residences, a school, and I-70 nearby, they felt they had with no alternative but to exterminate the animals. At first glance I wondered if Chivers was promoting the Esquire piece because he is a contributor to the magazine. His realm is usually military affairs. But given what happens throughout both stories, I guess commentary from the author of the book and blog entitled "The Gun," makes sense. And Chivers is right, the lead of the Esquire story, along with the rest of the piece, is gripping and heartbreaking, and the package has some strong, atmospheric photographs by Pari Dukovic. However the GQ story – also a dramatic and wrenching narrative – scores big points for stepping away from the terrible chain of events that led to the death of 50 animals and their keeper to look more deeply into the issues surrounding private collectors of "charasmatic megafauna," and this troubled keeper of a private zoo in particular. Gawker had fun with the magazines' fight to own the Zanesville zoo story, and it's an interesting exercise to hunt for inconsistencies between the two stories. In many ways they are quite similar, right down to both being written by guys named Chris - Jones at Esquire and Heath at GQ. On his blog, writer Brandon Sneed has an elightening and very long interview with Jones about the reporting and writing of the Esquire story, and the competition between him and Heath to get the scoop. But in the end, I wish both would have dug into the problems presented by horders of large predators and other exotic animals. Thompson released his animals within a couple weeks of being released from prison for weapons charges - a few of his more than 100 guns had no serial numbers. According to the Esquire story, the numbers had been filed off the weapons. Thompson seemed to show the same negligence with his animals that he did with his weapons. While most of his exotic animals were healthy, his home was squalid, his property covered with rusted cars (a number of them classics). He had been charged, but not convicted, of animal cruelty when cattle and a buffalo were found starving on his property. When Thompson was released from prison, his wife was not waiting for him, they split while he was incarcerated, and he faced financial problems that were certainly exacerbate by the needs of his nearly 60 exotic animals, some of which required hundreds of pounds of meat a day. Deputies in the sheriff's office predicted that it was only a matter of time before something bad happened. In fact, the sheriff left to oversee the culling of Thompson's animals had long tried to deal with "T's Wild Kingdom," but nothing that Terry Thompson was doing with exotic animals on his property, including, apparently, letting them loose, was against the law, at least in Ohio. State efforts to regulate exotic animal ownership have proven largely toothless - after one fatal encounter between an exotic animal and its keeper Gov. Ted Strickland issued an executive order banning exotic animal ownership (but grandfathered in people who already owned exotics), but the ban lasted just 90 days. A Pro Public investigation after the slaughter of the animals showed that Ohio has the highest rate of exotic animal escapes in the country. "It's just a free-for-all in Ohio...," Wayne Pacelle, president of the Humane Society of the United States, told the Associated Press. "Tigers, wolves, bears in a suburban Lorain County community: It is a disaster waiting to happen." That disaster came in October, but it didn't have to. Thomspon had another alternative for his animals. There are a number of sites where large predators can go, such as The Wild Animal Sanctuary in Keenesburg, Colorado, and the International Exotic Animal Sanctuary in Boyd, Texas that specialize in providing homes to the world's largest predators which are no longer wanted by the private collections and circuses they have lived in, but cannot survive in the wild. But in the case of many of these private menageries, it's not so much about the animals as it is about the collection. While many of Thompson's friends have testified to the love he felt for his lions and tigers and bears, the end he assured those animals when he released them doesn't offer much evidence of concern for their well being. As shocking as the incident in Zanesville was, even more surprising is how widespread private collections of exotic animals are. There are more tigers in private collections in Texas than there are wild in any nation on earth. 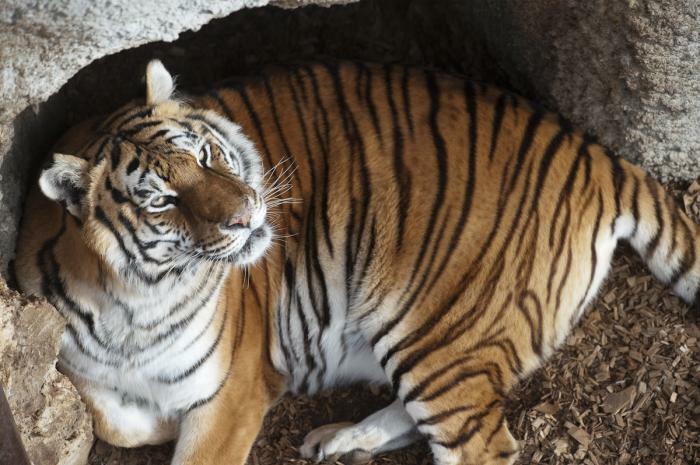 With inconsistent regulation at best, numbers of privately held exotic animals are hard to come by, but it's almost certain that there are actually more tigers in captivity than there are in the wild. Exotic animals that outgrow their cuteness or novelty often come to tragic ends or impose it on others, as in the chimp in Connecticut dressed like a child that tore off the face of its owner's friend. In Ohio recently a kangaroo in badly beat its keeper, and a bear killed its caretaker in a Cleveland suburb. A recent study shows that pythons imported into Florida and released in the Everglades when they were no longer wanted as pets have devastated populations of native wildlife. The numbers of raccoons and opossums in the Everglades have declined by 99 percent, and bobcat populations are down 88 percent. Several years ago I responded to a police call for a man who had been attacked by his pet python in eastern Connecticut. The animal, which the owner had moved into a bathrooom in his apartment while he cleaned its cage, had attacked him when he tried to return it to its quarters. It swallowed the man's arm up to his shoulder and certainly would have killed him, but the owner managed to hold the bathroom door shut on the snake to prevent it from constricting him. While he waited for the police to arrive, the snake ripped the toilet off the bathroom floor. Police officer extracted the man's arm from the python, then shot it in the head and decapitated it. It was still writhing, headless, in the backyard when I arrived. Even headless, it was nearly 19-feet-long, making it the second longest snake in the United States when it died - only a reticulated python in the Bronz Zoo was longer. Nobody but its owners knew the snake was living in a residential neighborhood thousands of miles from its natural habitat.